A few weeks before Father's Day I asked my Instagram family what I should make for Sushil that used pineapple. 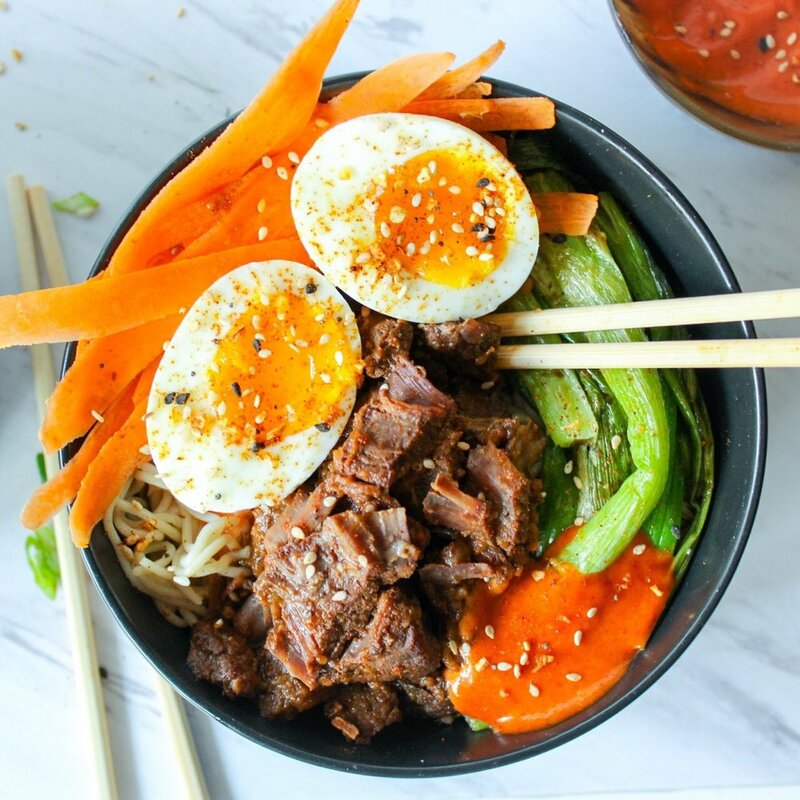 I got a ton of great suggestions, and what I ended up with was this...Korean Beef Noodle Bowl. Okay, so it's not revolutionary...at all, but I had an itch to use the gochujang paste I ordered through Thrive Market. Gochujang is a fermented chili paste that kind of reminds me of chutney. It's also known as Korean ketchup. When you search Korean beef on the Internet you will notice that the recipes use pear along with a few other ingredients to season the beef. That's when I decided to swap out the pear for some lovely fresh pineapple to marinate the chuck along with the gochujang. 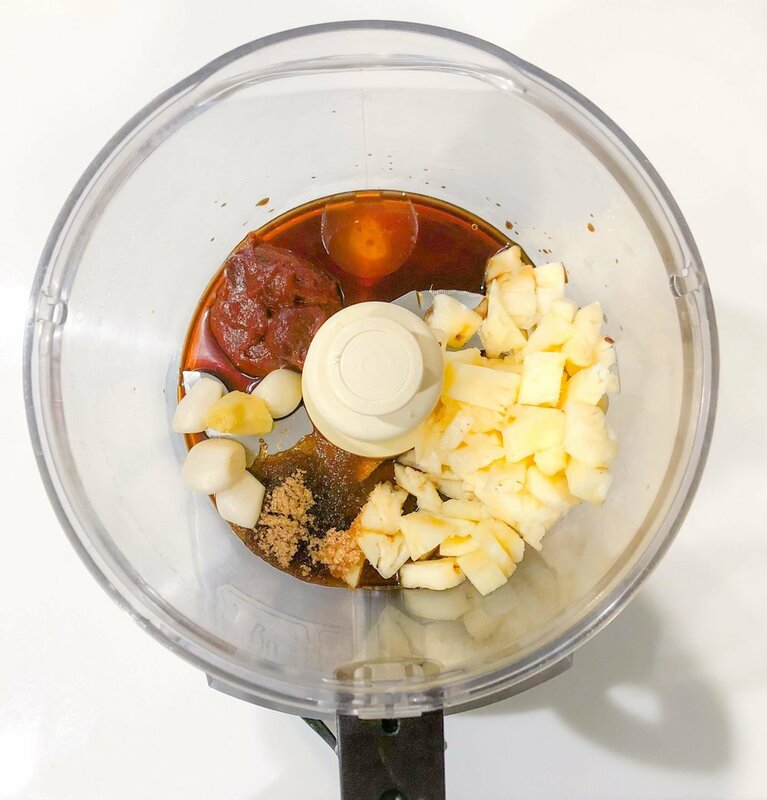 The pineapple was so naturally sweet and added a citrus pop to this marinade that I made right in my food processor. And to make life (errr....dinner) even easier I let my Instant Pot do the heavy lifting. You can get fancy with the bowl toppings like I did here...charred scallion, soft-boiled egg, and shaved carrot or just use whatever you have on hand! I have a few options listed below. Don't miss the Pineapple Old Fashioned that I made as our Father's Day signature cocktail...I think I had three that week!!! Everything turned out incredibly perfect for my hubby ;) Happy Father's Day to all the great dads out there! Blend together onion, pineapple, garlic, ginger, soy sauce, gochujang paste, brown sugar, and sesame oil until smooth. Place beef, marinade, and sliced onions in the bottom of your Instant Pot liner. Add broth or water to ensure that there is enough liquid to allow the Instant Pot to come to pressure without burning the ingredients ( I usually put just enough to cover the contents). Cook on high pressure for 30 minutes, then let the pressure naturally release for 5 minutes before venting and opening the lid. Adjust seasonings (salt, spice) if necessary. You can leave the beef in larger pieces or shred it depending on your preference! You can also use the Saute function on the Instant Pot to cook and reduce the sauce for 5-10 minutes if you wish. Mix ingredients for gochujang mayo and set aside. Build bowls with noodles, shredded carrots, sprouts, scallions, mayo, kimchi, bok choy, soft cooked eggs (i.e. poached, soft-boiled, or sunny-side up), sesame seeds, peanuts or any other toppings you like! You can also make tacos!!! Yummmm!